This summer my 9 yr old was reading Bambi to herself during a daily independent work time, and I wanted her to have some language study (writing, spelling, a bit of grammar) to go along with the reading. I did not ask her to give actual narrations of the book; she was narrating from other subjects. These are the lessons I wrote for her (there are one or two from the beginning of the book I didn't include). Please note this isn't a study guide, exactly; I haven't asked her to map the plot or fully describe the characters. It's just a weekly lesson involving different aspects of language study (I used some ideas from Ruth Beechick's books). 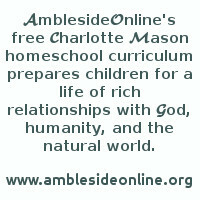 Why am I sending this to AmblesideOnline? First, because Bambi is [was] one of the Year Three books, and second, because I thought you might find some ideas here for ways to use the books you're currently reading. There are a couple of other things I should say. First, I have seldom assigned creative writing to my daughter, and definitely not on a weekly basis. I deliberately asked for short descriptive paragraphs, not full stories. I wanted to see what she could do! Also there are a couple of references to "the green section", things like that--I was playing around with coloured fonts but you can't see them here. The old stag looked at him. "It's a long time since I've seen you," he said. "You've grown big and strong." Bambi did not answer. He trembled with joy. The old stag went on examining him critically. Then he came unexpectedly up to Bambi who was terribly frightened. "Act bravely," said the old stag. He turned around and in the next moment had disappeared. Bambi remained in that place for a long while. 1. Copy the passage carefully, double-spaced. Underline these words:examining, trembled, terribly. What spelling rule is being used here? Find five more words (from anywhere) that use the same rule. a) "It's my birthday!" Joe shouted ____________. b) The tattered old man walked away ____________. c) Alice took up her sewing and worked ____________. 3. What are the stag's final words of advice to Bambi? Do you think they were important? Read some of Solomon's advice to his son in Proverbs 1:8, 10 and 3:1,2 . As a writing assignment, choose one of these ideas and write a paragraph something like the one above. 4. Write the paragraph from dictation again. "What a haughty look," thought Bambi. "It's unbearable, the opinion such people have of themselves." The stag was thinking, "I'd like to talk to him, he looks so sympathetic. How stupid never to speak to people we don't know." He looked thoughtfully ahead of him. "I might as well be air," said Bambi to himself. "This fellow acts as though he were the only thing on the face of the earth." "What should I say to him?" the old stag was wondering. "I'm not used to talking. I'd say something stupid and make myself ridiculous...for he's undoubtedly very clever." 1. a) Copy the green section carefully, double-spaced. b) Underline these words: undoubtedly, unbearable, haughty, thoughtfully, sympathetic. Which words contain silent letters? Mark the letters you don't hear, and study them for Friday's dictation. c) Find all the places with the letters "ea". How many different ways are they pronounced here? 2. Make a list of the reasons Bambi and the old stag don't talk to each other. Do you ever have the same feelings when you meet someone for the first time? Write a short conversation (out loud or just thoughts) between two people who want to talk to each other but are feeling too shy. 3. Look up these words in the dictionary: haughty, sympathetic. Write down a good definition of each (you can illustrate if you want). The forest sweltered under a scorching sun. Since it rose it had driven even the tiniest cloudlet from the sky, and shone all alone in the wide blue depths that were pallid now with heat. Over the meadows and the tree-tops the air quivered in glassy, transparent ripples as it does over a flame. Not a leaf was moving, not a blade of grass. The birds were silent and sat hidden among the shady leaves, never stirring from their places. 1. Copy the passage carefully, double-spaced, but change it into the present tense. Like this:The forest swelters....Since it rose it has driven....etc. 2. Is it possible to write in an interesting way about a time or a place where absolutely nothing is happening, as Salten does here? What kind of a mood does this create? How do you feel when you read this? (relaxed, sleepy, tense, afraid, cheerful?) As a writing assignment, think of either a very hot or a very cold day, and try to make me feel how hot or how cold it is just by the words you choose. 3. Underline five words with double consonants. How would you pronounce them if they had only single consonants? Study these words (and any others you're not sure of) for dictation. Spell them to yourself, looking at the words; then close your eyes and see if you can see them spelled correctly in your head. Then the old stag asked in his quiet commanding voice, "What kind of a band is that you have on your neck?" Everybody looked at it and noticed for the first time the dark strip of braided horsehair around Gobo's neck. Gobo answered uneasily, "That? Why that's part of the halter I wore. It's His halter and it's the greatest honor to wear His halter, it's..." He grew confused and stammered. 1. Write the paragraph from dictation, or copy it out neatly. Find as many places as you can where there are two vowels together. Is it true that "when two vowels go walking, the first one does the talking"? Circle the places where that rule holds true. 2. As a writing assignment, explain why you would rather be either Bambi or Gobo--how are they different? OR write what the old stag is thinking about as he disappears again. (Why did he say what he did?) Take some extra time on this one--you have most of the week. 3. Write the paragraph from dictation again. "I think it will be hard for you to get accustomed to the winter, Gobo," Faline began, "we don't have hay or turnips or potatoes in the winter time." "That's true," answered Gobo reflectively, "I hadn't thought about that yet. I can't even imagine how it would feel. It must be dreadful." Bambi said quietly, "It isn't dreadful. It's only hard." "Well," Gobo declared grandly, "if it gets too hard for me I'll simply go back to Him . . . "
1. Copy the paragraph carefully. Choose (circle) three words that you think are difficult to spell. Practice them by saying the letters over to yourself, then closing your eyes and trying to visualize (see) the word spelled correctly in your mind. Open your eyes:did you see it spelled right? 2. a) Find all the words (IN THIS PARAGRAPH) that end with an "ly". Do you know what a "Tom Swifty" is? Here's an example:"I really like ice cream," he said coldly. Here's another:"This bunny's tail feels like cotton," she said softly. Can you make up any more? 3. What is the difference between "dreadful" and "hard", according to Bambi? Think over your answer and be ready to discuss it. 4. Write the paragraph from dictation. There were a couple of mother ducks, each with a flock of young ones around her. They were constantly teaching their young ones things. And the little ones were always learning them. Sometimes one or the other of the mothers would give a warning. Then the young ducks would dash off in all directions. They would scatter and glide away perfectly noiselessly. 1. Choose one sentence from the paragraph. Copy it three times in cursive, trying each time to keep your letters the same size and improve any letters that look messy. Aim for perfection! Mark your best attempt and show it to me. 3. Write the paragraph from dictation. Mad with teror, he sprange back into the thiket and kept running. He did not undrstand what had happened. He could not grasp a singel idea. He could only keep ruining on and on. Fear griped his heart so that his breathe faled as he rushed blindely on. Then a kiling pain shot thorough him, so that he felt that he could not bare it. He felt something hot running over his left sholder. It was like a thin, bunning thread coming from were the pain shot through him. Bambie had to stop running. He was foarced to walk slower. Then he saw that he was limping. He stank down. 1. Correct all the spelling mistakes you can find in the paragraph above. 2. Write a paragraph about someone who has just been hurt or had a large aching tooth pulled. (Remember the time you fell on the sidewalk?) What did it feel like? What did you do? Can you write it so that the person reading it wants to go "ow"? 3. Write the coloured part of the paragraph from dictation.